Last week I attended the Society for American Archaeology annual meeting, held this year in Washington D.C. This was a particularly pertinent meeting for Campus Archaeology because a symposium was held in honor of Dr. Lynne Goldstein. As she nears retirement and the end of her tenure as professor and CAP Director, it was evident from the symposium that her influence on the field of archaeology is far from over. The impact of her mentorship to students and the collaboration with colleagues was felt throughout every paper. One theme that prevailed throughout the symposium was landscape and the ritual use of space. Dr. Goldstein has written extensively about mortuary patterns (how, where, and why people bury their dead) and regional analysis to evaluate patterns of settlement and ritual land use. Papers from MSU’s own Dr. William Lovis and Dr. Jodie O’Gorman, in addition to former Campus Archaeology fellow Dr. Amy Michael, all paid tribute to Dr. Goldstein’s legacy by considering their own research from this spatial perspective. This got me thinking: what is the ritual landscape of Michigan State University, both past and present? And how might we see this archaeologically? Dr. O’Gorman discussed how migrating populations may maintain certain rituals from their place of origin, while also engaging in new rituals in order to integrate both into the social and natural environment of their new homes. This is reflected in the environment of a college campus. Students come to MSU from across Michigan, the US, and abroad bringing their own rituals and personal items with them. However, once students arrive on campus, they form and engage in a united identity: that of an MSU student. This identity can then be enacted through rituals that are often closely tied to specific locations across the campus landscape. MSU tail gaiting today. Image source. 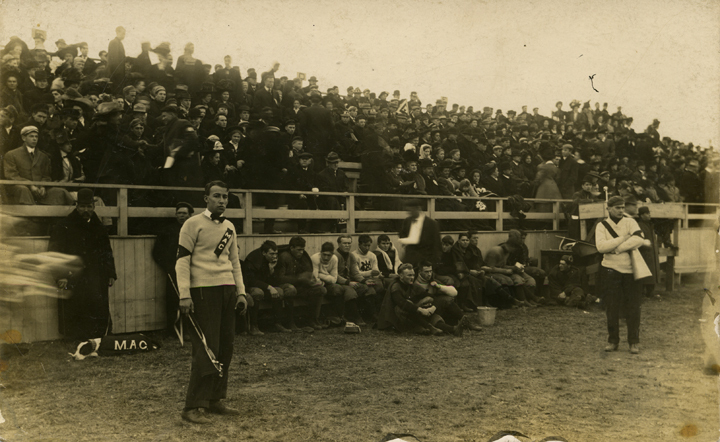 Sports comprise an important part aspect of MSU identity. 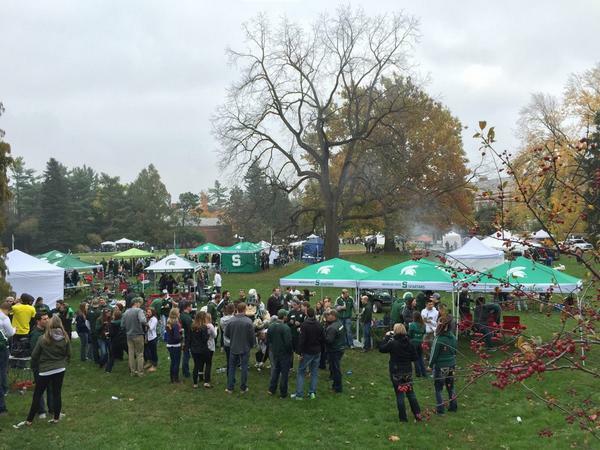 Football games and tailgating are important rituals at MSU. While football itself might not leave behind the much in the way of archaeological remains (besides a giant stadium), tailgating certainly might. Archaeologists often find refuse pits with large amounts of food refuse and broken pottery, the remnants of ancient feasting events, or large meals accompanying special occasions or ceremonies. Many ancient societies held community-wide events that left significant archaeological signatures, such a large amounts of broken pottery and food refuse. Today, the area around the tennis courts on the MSU campus are the hub of student tailgating, a form of feasting, and will likely someday be a treasure trove of interesting finds (at least those items missed by MSU’s otherwise stellar clean-up crews). If tailgating or other sport-related revelries were historically held elsewhere on campus, we may find evidences of these activities during our campus surveys. 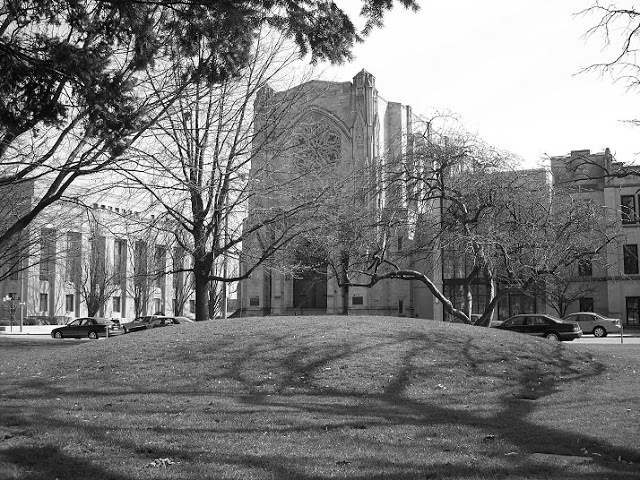 The “Sacred Space” is the large open area north of Beaumont Tower, which is the unofficial “center” of campus. New construction has been banned in this area since the 1870s. Although students certainly use this space, and in the future we may find refuse of their presence there, we would not expect to find much in the way of trash pits or construction refuse dating to after fits establishment (although the pre-1870s archaeology of this area is quite rich). This is common of many ancient city center plazas, where city-wide ceremonies were held. Sometimes the absence of structures or other archaeological evidence is the strongest indicator of ceremonial space as they are kept clean and clear of structures to allow room for ceremonies and their participants. Graduation is arguably the most significant ritual enacted on a college campus. 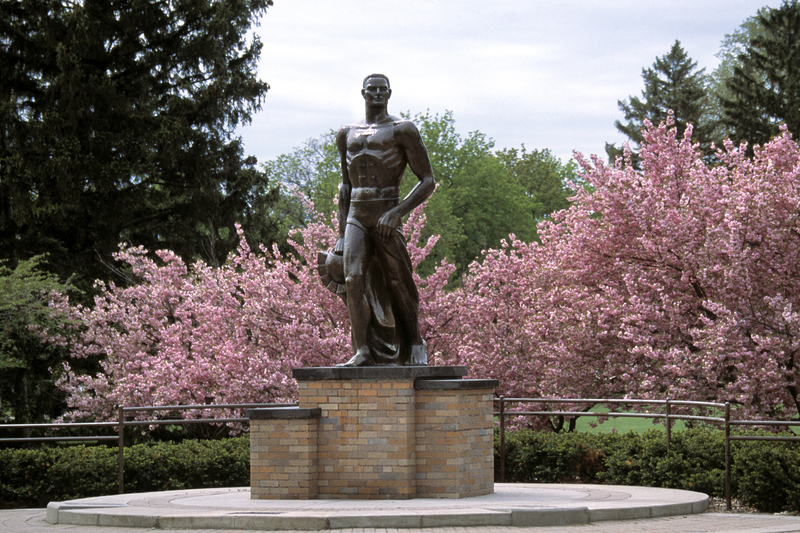 Graduates routinely get their pictures taken next to the Sparty statue on north campus, and may even hold more significance in this milestone than the location of the actual graduation ceremony. Sparty is what archaeologists call a “monument,” or large, immovable objects that visually mark space with significance and meaning. Monuments are common in the ancient world, from the burial mounds of the Midwest, to the obelisks and temples of ancient Egypt and Greece. 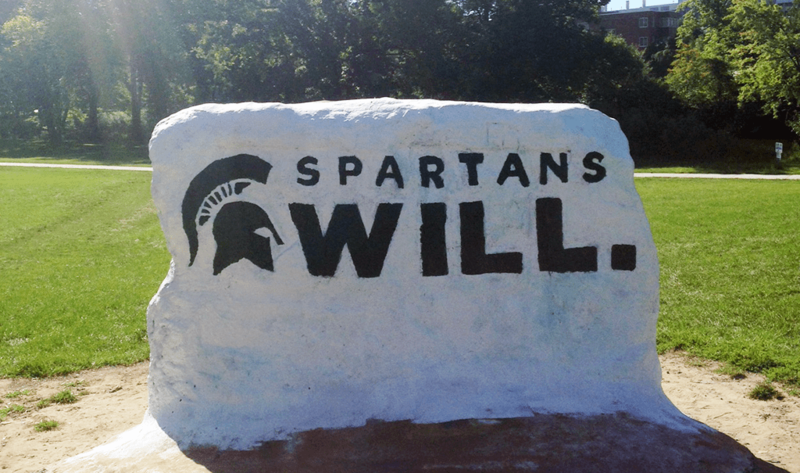 The Rock, a more informal monument on campus, is a large boulder which various student groups take turns painting, either promoting their student group or serving as a way to express solidarity, protest, and/or discontent with current events. It is so much a symbol an important symbol of MSU heritatage that someone wrote a whole book on it! Students sometimes camp out to ensure their chance for painting the rock, so we may one day be able to see this refuse archaeologically. A few years ago, a chunk of the hundreds of layers of paint fell off, revealing an enthralling stratigraphy representing decades of student voices and creativity. One artist made “Spartan Agate” jewelry from it, allowing alum to wear a piece of MSU archaeological history around their necks. CAP’s yearly Apparitions and Archaeology Tour is inspired by ghost stories associated with various buildings and features across the campus. These spectral legends are closely tied to landmarks on the landscape but leave no archaeological trace. These represent aspects of the past that archaeologists want to know but struggle to uncover: myths and legends. Reflective of a culture’s ideology, oral histories and myths often prove elusive to archaeologists unless recorded in the written records. Even in the age of print and social media, these ghost stories might have simply been passed down from generation to generation of students without official recordation, eventually forgotten, had they not been recorded by CAP for our famous tour. One way oral history and archaeology can converge is through public outreach. So, I turn the rest of this blog over to you, dear readers! If you are a current or former student, faculty, or staff member, what are the places on campus that are most special to you? Are there areas of ritual or ceremonial significance that you know of (used by a specific student group, etc) from the past or present that Campus Archaeology should know about or document? Share your stories in the comments! 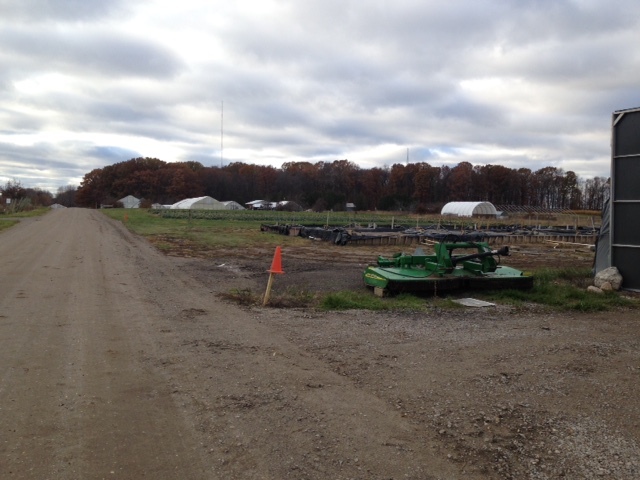 This past November, Dr. Goldstein, Dr. Camp, and several CAP fellows visited the MSU Student Organic Farm for a tour and to discuss a possible partnership. Tucked away in the southern reaches of campus, the farm is a tidy series of fields and greenhouses, the latter of which allow food to be grown year-round. Established in 1999 by students who wanted to learn how to grow food in sustainably, the SOF provides experiential learning opportunities resulting in productive outcomes, such as a successful CSA, the sale of produce to MSU Culinary Services, and products packaged and sold by Land Grant Goods, MSU’s first student-run business. The Student Organic Farm is part of a long history of experiential learning from agricultural labor at MSU. If you weren’t already aware, Michigan State University was established in 1855 as the Agricultural College of the State of Michigan. 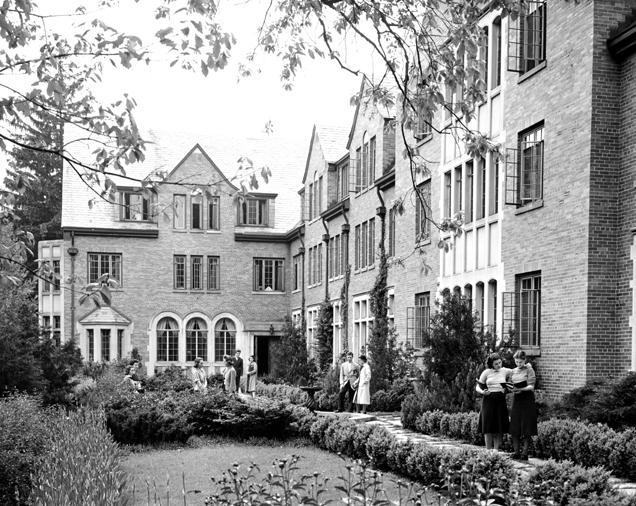 It served as a model for the Morrill Acts of 1862 and 1890, which allowed for the establishment of land-grant colleges that were devoted to educating students in agricultural and mechanical arts, as opposed to the typical liberal arts colleges of the day. Therefore, agriculture is inextricably tied to the foundations and history of MSU. 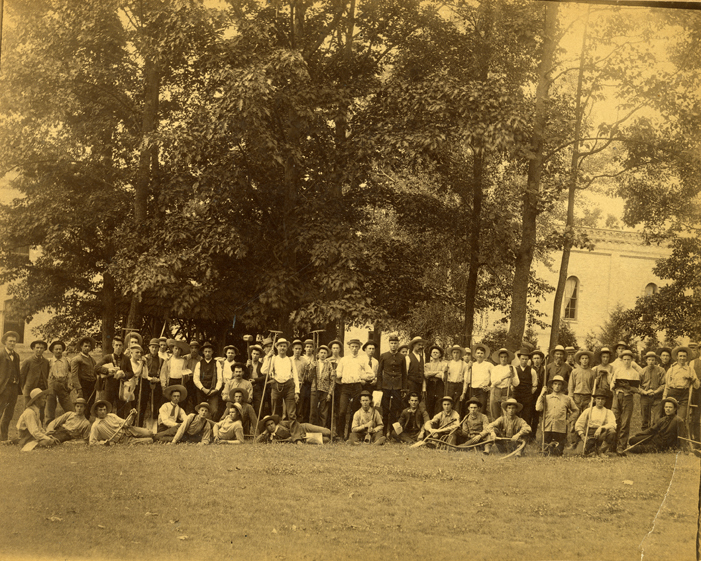 Agricultural students posing with farm implements on campus,1886. Image Source. One of the central tenets of the early College was the “judicious combination of labor and study”—meaning that labor and hands-on experiential learning was as important as classroom learning (1). The earliest students were expected to labor on campus for three hours every day, “planned with reference to illustrating and applying the instruction in the Lecture Room” (2). 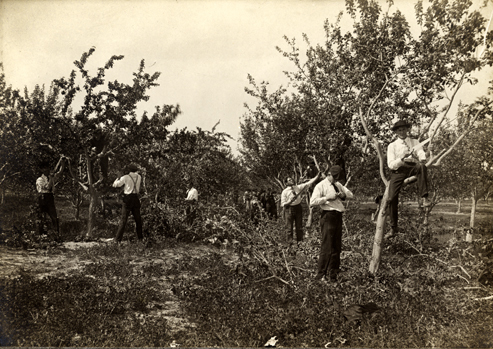 The earliest students spent as much time working the agricultural fields as they did clearing the lands surrounding the college for future agricultural endeavors. In his 1858 diary, Edward Granger mentioned “logging” and “chopping wood” as his daily tasks almost as often as “gardening” (3). Students were compensated for their labor, and this remained one of the major arguments in favor of required labor. It allowed students who may not otherwise be able to afford to attend college to receive higher education. Money earned in the fields went towards the cost of room and board and made education available to poor farm boys from across the state (1). However, mandatory labor eventually became unpopular with students. An 1882 op-ed in The College Speculum complained about compulsory manual labor, which students felt no longer allowed them learning experiences, and instead labor assignments were made based on existing student knowledge and strengths. Individuals who did not know how to do certain tasks were not assigned to them for the sake of efficiency, which robbed them of opportunities for learning new skills (4). Discontent and resentment among the students was on the rise. By 1884, daily labor requirements were reduced to two-and-a-half hours daily (5), perhaps in response to this discontent. 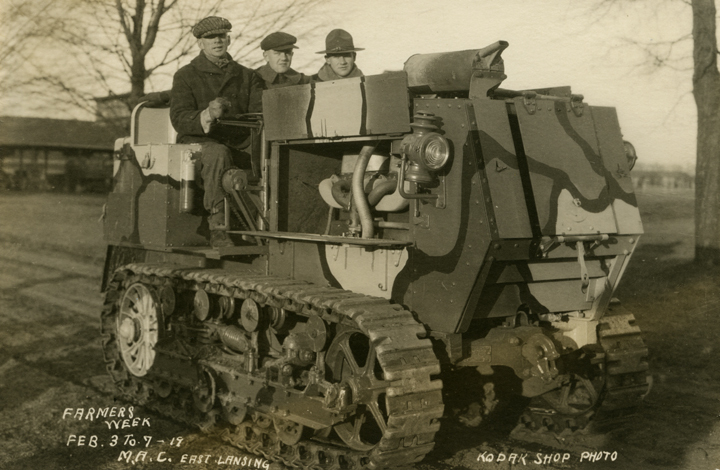 Three students on a tractor in 1919, zooming into the future and leaving mandatory labor behind. Image source. Mandatory student labor continued at MSU much longer than it did at other land grant institutions. This was made possible by the College’s unique yearly schedule. Classes were held spring through fall, with the long vacation break over the winter months. It was this schedule that allowed student labor to remain a major part of the College’s curriculum for over forty years. However, in 1896, the College moved the long break to the summer months, and without viable labor options over the winter, mandatory labor requirements came to an end (1). This does not mean there was an end to experiential learning. Students have continued to work on the MSU Farm, Dairy, and Dairy Plant, gaining practical experience everyday. And the establishment of the Student Organic Farm demonstrates student hunger for experiential learning and the productivity such endeavors can result in. So why did CAP visit the Student Organic Farm to begin with? Why this exploration of student labor? There is a possible collaboration between our two organizations that is on the horizon, but that’s all I can say for now. Stay tuned for more news! Kuhn, Madison (1955) Michigan State: The First Hundred Years. The Michigan state University Press East, Lansing. The College Speculum, Vol. 2 No. 1, October 2, 1882. 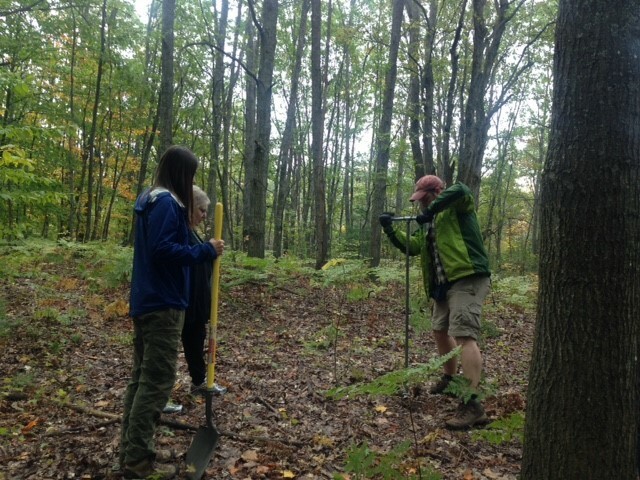 In mid-October I went with Dr. Goldstein and CAP Fellows Mari and Jack to check out a possible precontact-period Native American burial mound. Although we are Campus Archaeology, we like to do outreach that extends beyond MSU. This usually entails activities at elementary schools, the Apparitions and Archaeology tour, Michigan Archaeology Day, etc., but this was a unique opportunity to help out a landowner who was curious about a unique feature on his land. More importantly, it was a potential opportunity to document an important aspect of Native American cultural heritage. Mounds constructed by Native American groups are found across Eastern North America, some of the earliest dating back thousands of years. Some of these are large platform mounds, such as Monk’s Mound at Cahokia in Illinois (if you haven’t heard of this ancient city, look it up! ), which were used for ceremonial purposes, but there are few of these in Michigan. More common in this area are conical (round) burial mounds, attributed primarily to Woodland groups (1000 BC – AD 1600). Mounds are often found in groups, and while you may equate this to an ancient cemetery, you should instead be careful of such a simple comparison. Euro-American culture generally separates the physical remains of the deceased from any spiritual significance. Cemeteries are where bodies are laid to rest, while the individual’s spirit or soul continues on elsewhere. Therefore, cemeteries are places of memorial for those who remember the deceased, typically secular in nature. While we respect human remains, their significance lies in the memory of the living, and memory, as we know, is often fleeting. On the other hand, Native American societies believe that the human remains hold spiritual significance and power. Therefore, burial grounds, including mounds, are sacred spaces – sanctified grounds of great ideological importance. Native peoples past and present feel that they are spiritually linked to all their ancestors and are therefore responsible for protecting their physical remains in perpetuity, ensuring they are undisturbed. Understanding this ideological difference about human remains is important for understanding why archaeologists strive to preserve and protect these burials. While archaeologists find ancient skeletons very informative about past lifeways, we have come to understand the value of human remains to their descendant communities. We now identify mounds in order to protect them, and no longer excavate them unless they will be destroyed by construction and an agreement has been made with affiliated Native American tribes to move the remains elsewhere. Laws such as NAGPRA have been enacted to aid in the protection of these important heritage sites. We encourage our readers to respect these sacred mounds and leave them undisturbed. 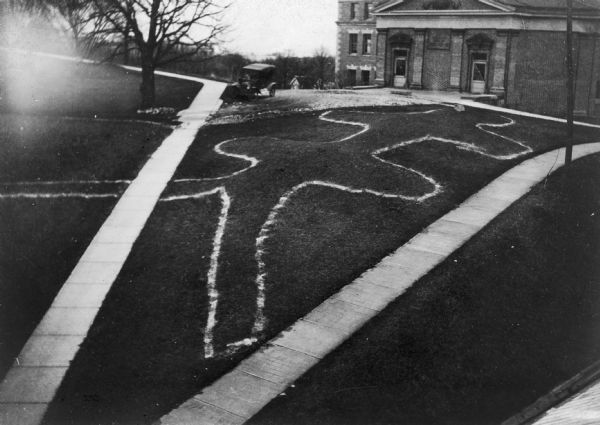 While we don’t have any burials, ancient or recent, on the MSU grounds, The University of Wisconsin-Madison (my alma mater) has a few effigy mounds on its campus. The Effigy Mound Tradition (AD 650 – 1200) of Wisconsin, Minnesota, Iowa, and Illinois constructed burial mounds in the shapes of birds, various quadrupeds, and even the mythical water panther (a tear-drop shape). Our own Dr. Goldstein (1995) wrote a wonderful piece on how the effigy mounds not only represented clans, but also mapped out important resources across the landscape. These mounds, therefore, were layered with meaning and integrated the sacred remains of the dead with the spiritual and physical sustenance of the living. Ultimately, our mound hunting expedition turned up short. The feature we investigated was sadly not an ancient Native American mound, but we are grateful the landowner called on us to check it out. We would rather investigate a false mound than allow a legitimate mound to remain undocumented and endangered. In the end it was a fun expedition to the woods, and we all learned a lot from the experience. And if you find yourself wandering about a modern or historic cemetery this Halloween, try to remember that these are places for memorial of those who have gone before us, and be respectful. But… that doesn’t mean that you can’t look for some lingering spirits along the way…. 1995 Landscapes and Mortuary Practices: A Case for Regional Perspectives. In Regional Approaches to Mortuary Analysis, edited by Lane A. Beck, pp. 101 – 121. Plenum Press, New York.